So you want a few extra horsepower up top on your Yamaha R6? The air filter snorkel removal is an easy way to get the engine more air. More air, more power. The 3rd generation Yamaha R6 has a “snorkel” on the intake side that was designed to reduce engine air intake noise. This snorkel is a restriction however, as is easily seen in the photos. 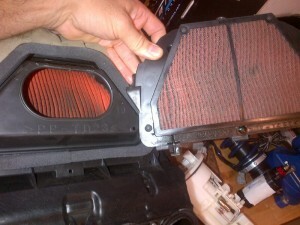 The BMC air filter has a few different model air filters. One has a removable snorkel that needs to be in place if you race in a supersport class. Or if you are not worried about that and it’s for a superbike class, or for the street, you can leave the snorkel off or get the cheaper model that does not come with the snorkel. 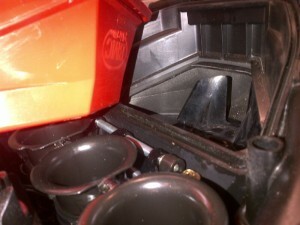 Another option, is just cut the plastic restrictive snorkel off of your stock air filter. The real test was on the dyno, and yes, it makes more power. I don’t have the actual dyno sheet, but when we first heard about this modification back in 2006 when the 3rd generation R6 came out, we tried dynoing with it, then without. Even before any tuning for the extra air was done, the dyno showed a 2 hp increase at peak power. Some noted professional tuners (real race engine builders and tuner) have indicated as much as 5hp gained up top from removing the restrictive snorkel. So, addition to having the fuel injectors serviced, make this simple and free modification to get a little extra power. 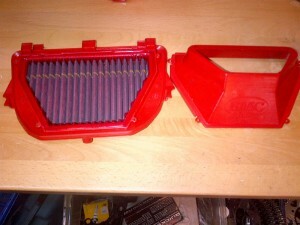 Here is a BMC filter, with the snorkel that attaches on the right. Notice how much smaller the opening is than the actual filter area? Here is a stock R6 filter, on the left is the bottom of the filter in the airbox, on the right is the top of another stock filter. Again, notice the difference in the area air can pass. 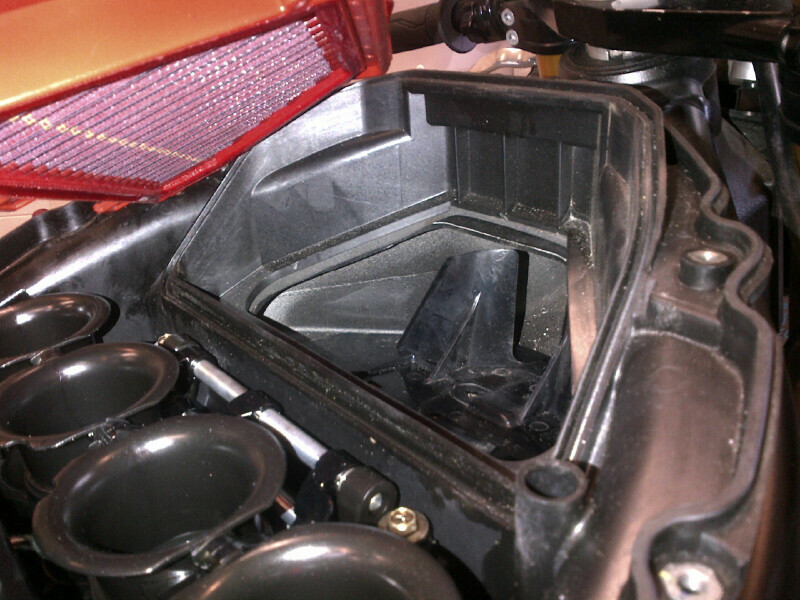 With the snorkel in place, you can see where it is located within the intake area. Again, notice how much this device blocks air flow. The two black diverting fins just inside keep rain from hitting the filter media directly and should not be cut out. Here is a photo just like above, but with the snorkel not screwed into place. Notice now how much more open the air intake area is. You will notice more intake noise with this modification as the rpm’s rise, but you will also have a few more horsepower. It is ideal to let us at ProFlow Technologies ultrasonically clean and flow test the fuel injectors, and then dyno the bike to ensure it is not lean after increasing the air flow.